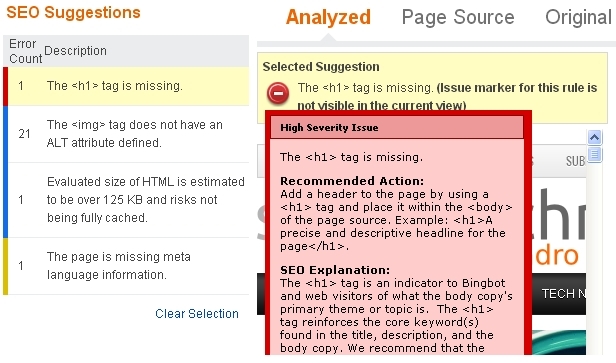 There are a number of errors that may cause lower SEO. Sometimes these are technical errors, i.e., they are caused due to error in your template codes like not using appropriate tags, missing the 'alternative' attribute in images, etc. These errors can only be corrected by professionals only. That also means that you cannot know that there was some SEO problem. But there is a way to know the SEO problems. Login into your Bing Webmaster tools using hotmail account. Goto 'Diagnostics & Tools' > 'SEO Analyzer'. Place any URL of you verified site, and click 'Analyze'. A report will get generated. Report is divided according to color code. How to disable or enable images in Gmail? How to Change your Blogger feed address?